Annie is a stunning young female with great lineage her grand sire is he most notable El Dorado on her maternal side inheriting the sweetness of her mom as well. She has a beautiful dark silver-gray blanket and will likely be even more stunning as time passes. Not only carrying an award winning personality she has superb conformation and has excellent fiber characteristics throughout. 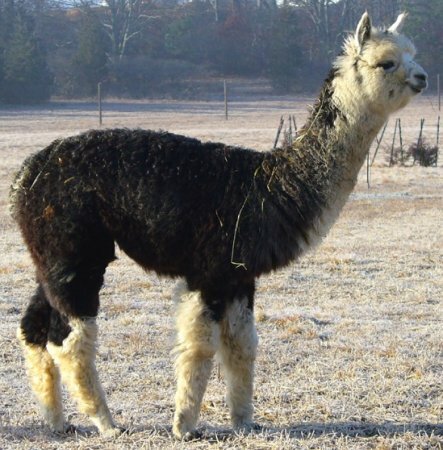 Her 2008 shearing resulted in 6.7 pounds of fiber, yielding a 6.8 percentage of fleece to body weight-her weight, which was, a week later, 97.8 pounds. Tremendous density, nearly twice the amount for the average alpaca! Annie has been bred to CT Estrada for a summer 2010 cria. We look forward to seeing what this pairing can do-- we are certain this cria will have fabulous density... and perhaps could result in a rose-grey alpaca. We are very excited to have Estrada in our herd and our breeding program. Estrada has very dense, fine fleece, with a high-frequency crimp all over, great coverage and conformation. Most recently Alpaca judge, Wade Gease has said about Estrada, "He is the "complete package". Very nice fleece style and crimp formation throughout. He has kept his fineness/softness." Also, recently, Judge David Barboza has said about Estrada: "His architecture and density is incredible! Spot on!" 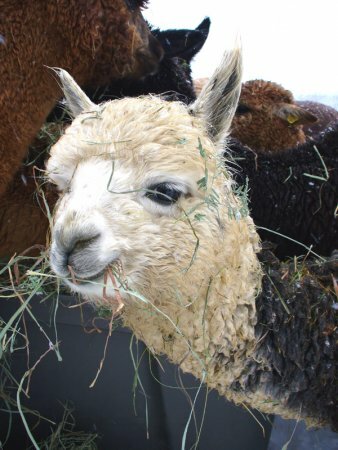 And Alpaca Fleece Judge, Cheryl Gehly has written: "Wow! Fine with great character! Quite uniform for micron." "Beautiful Fleece: fine, bright, well organized!". awarding him first place in the competition, and again, after the fleeces third showing at the 2009 Empire Symposium and Fleece Event, she commented again; "Beautiful Fleece: fine, bright, well organized!". The latest news...Estradas fleece (its fourth showing) took yet another blue at PAOBA show, May, 2009. To date, Estrada has 4 Champ/Reserve Championships, and 15 first-place, blue-ribbon awards. See the details of his show record below most in very competitive classes! Platinum has won two Reserve Championships along with four 1st place blue ribbons.